If there is something that I always recommend to my students, is to read a lot about the theory behind computer graphics, because not only from visual exercises we learn to be better artists. From all the reading available on the web, I really like the ones that explain concepts and techniques that we sometimes use, but don't know what's going on the background. Today I will recommend the reading of two articles, related with the render theory and other with post-production for 3d artists. The Siggraph 2009 is still a few weeks ahead, but some of the papers that will be presented at the conference are already available, for anyone interested to know more about the recent research related to computer graphics. This kind of research has everything to do with Blender 3D, because from papers like this we can see potential features to Blender. 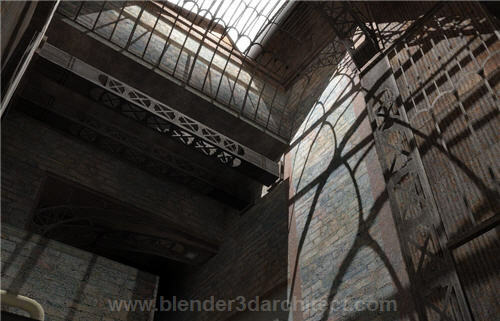 One of the articles that will be presented at the conference this year is about the application of Photon Mapping for real time render engines, which will allow us to use global illumination in games and interactive simulations. The technique described on the article is called Image Space Photon Mapping, and according to the description of the text, it will speed up the calculation and accuracy of the GI solution. If you follow the link, you will find the PDF file of the article, along with videos and stills of the technique. And for the second recommended reading, is a great article about something called Gamma Correction. This is one of those features that almost all softwares related with image creation, from 3d renders to image editors use to enhance images. But, what can we do with it exactly? An artist called Martin Breidt has posted an article explaining what is exactly the Gamma Correction and how can we use it to improve our images. The article has a great explanation on the theory behind Gamma and shows some examples of images with different sets of correction. If take a look on Blender 3D, at the composite nodes, we will find a Gamma node that will do exactly what's described on the article. You can find the article about Gamma Correction available to download in PDF here. Well, that's it! Those are some of the materials that I point to my students. The first one is more useful as a preview of what we will find in the future and the second one have a more practical application. I hope you enjoy the reading!